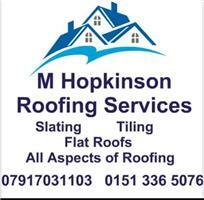 Hi this is Mike Hopkinson, I started my business 7 years ago and have been roofing for 15 years. I could of thought of a more catchy name to call my business but I decided I was more than happy to use my personal name as myself and any employee's take a lot of pride in the jobs we do and I am happy to stick my name to it. I am a fully experienced roofer, having gained on site experience and knowledge from the jobs i have completed. At the quoting stage I will always work with the customer to find out what the issue is and advise on the best options to fix the problem.